This extraordinary profile of Signac’s friend, the writer and critic Félix Fénéon is set against a swirl of spiralling, sinuous abstract designs. These background patterns were inspired by a Japanese wood block print, possibly a design for a kimono, which Signac kept in his studio, but the startling vortex also highlights the importance of pattern for the Neo Impressionists. Signac spent a great deal of time experimenting with the background composition, trialling many combinations of colour and form, pasting different layers onto a preparatory drawing. The painting is like a prospectus – bringing together the artistic, philosophical and scientific themes that interested Signac and Fénéon. The somewhat convoluted full title refers – perhaps with a touch of self-mockery – to these themes and to the theories of Charles Henry: Opus 217. Against the Enamel of a Background Rhythmic with Beats and Angles, Tones and Tints, Portrait of M. Félix Fénéon in 1890. In early 1890 Fénéon had written the first biography of Signac which appeared in Les Hommes d’aujourd’hui, a literary review. 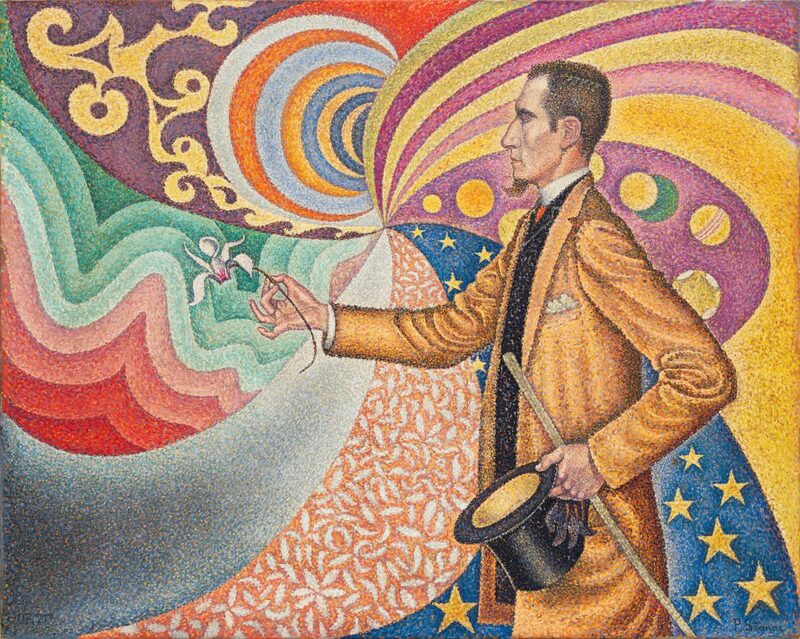 As an act of gratitude, Signac determined that he would paint a portrait of the critic: ‘It will not be an ordinary portrait but a carefully planned composition meticulously constructed in terms of lines and colours… A decorative version of Félix, stepping forward with a hat or flower in hand’. Perhaps the stylisation of Fénéon’s hand with which he so delicately holds a lily between his thumb and forefinger might be a response to aestheticism – Oscar Wilde’s Salome was produced in Paris in 1891. There is no doubt that the background to the portrait is a pean to the influential cult of japonism. Certainly this is no ordinary portrait but Fénéon was no ordinary man – a clerk at the War Ministry who supported the anarchist cause (for which he was put on trial as a suspect in a series of bombings – but acquitted), he found time to found and contribute to many art and literary journals, write innumerable reviews and mix with the greatest poets and artists of the day; a ubiquitous and witty critic and writer who selflessly promoted and uncovered the talents of others. ‘Two adjacent colours exert a mutual influence, each imposing its own complementary on the other; for green a purple, for red a blue green, for yellow and ultramarine, for violet a greenish yellow, for orange a cyan blue: contrast of hues. The lightest one become lighter; the darkest one darker: contrast of values’. He goes on to advocate ‘exemplary specimens of an art of great decorative development, which sacrifices anecdote to arabesque, analysis to synthesis, fugitive to permanent’. One could not see a better example of decorative exuberance or the stunning deployment of the arabesque than this portrait. This painting is a pulsating affirmation of Neo-impressionist theory and pointillist technique and a suitably unusual and eye-catching tribute to such an idiosyncratic and influential subject.